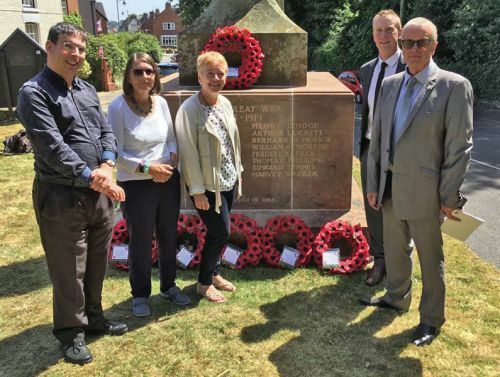 In June 2018, the Lord Lieutenant of Staffordshire unveiled a new memorial to 17 Eccleshall soldiers killed in the Great War. Pianist, writer and lecturer Duncan Honeybourne tells the story of one of them, his great-grandfather William Augustine Mossop. William’s parents, Edward Mossop and Ellen Hall, came from Irish families long settled in Staffordshire. Edward seems to have been a lively lad, starting off as a bricklayer and eventually setting up his own building firm. But in 1870 he hit the headlines when he was fined £2, plus £1 8s and 6d costs, after an altercation with a ticket collector on the North Staffordshire Railway. The Birmingham Daily Gazette of 14th February 1870, heading its article “Struggle in a Railway Carriage”, reported that Edward and his brother Thomas “were charged with having assaulted and impeded Abraham Williams while in the discharge of his duty…On the arrival of a train at the ticket platform, Thomas pretended to be asleep when his ticket was demanded, though his fellow passengers swore that they had seen him make faces at the officer behind his back. Williams at last shook Thomas, whereupon Edward jumped up and seized him…the passengers were obliged to call other officials before the Mossops could be restrained.” One hopes that Edward mended his ways, but his later fortunes were mixed. He settled briefly in the United States before returning to Eccleshall, but in middle age was declared bankrupt and moved south to Smethwick, where he reinvented himself as a steeplejack. William and several of his brothers joined their father’s business and looked after many Midland landmarks including Smethwick’s Galton Bridge and the spire of Coventry’s mediaeval cathedral. Having earlier joined the Army and served in Ireland, William signed up again early in the Great War. By now he was a married man, living in Birmingham with his young wife Emily. 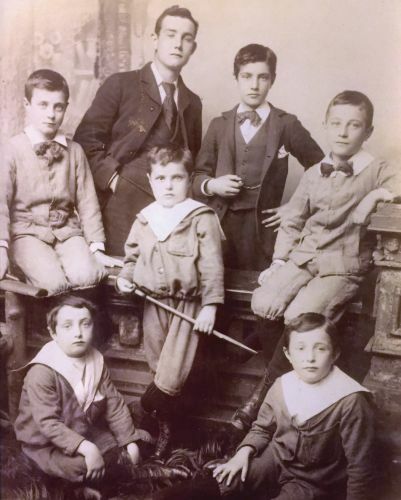 Of his five children, three predeceased him, and his youngest daughter died of whooping cough just three months after William’s own demise at the front. Only the eldest of his offspring, my redoubtable grandmother, survived infancy to tell the tale. As a musician, I have often spoken of my great-grandfather in lecture recitals showcasing WW1 composers and, last year, his name – and battle-scarred picture – were immortalised in a piece of music. As part of the Passchendaele centenary commemorations in Ypres Cathedral, the Belgian composer Ludo Geloen gave the world premiere of his own Warscape, for cello and harmonium, a powerful triptych dedicated to the memory of William Augustine Mossop, who had died there 100 years earlier and lies nearby “in some corner of a foreign field”. The exquisite closing piece, Keepsake, reflects on the weathered photograph’s journey to the battlefield and back. And indeed now this Staffordshire soldier himself has finally come home, to be commemorated forever in his birthplace.